Collaborative painting by mother and daughter, Teresa Pumani-Mula and Anita Pumani. Teresa Pumani is a senior cultural woman in Mimili community who paints the Kunkarunkara Tjukurpa (Seven Sisters Creation Story). 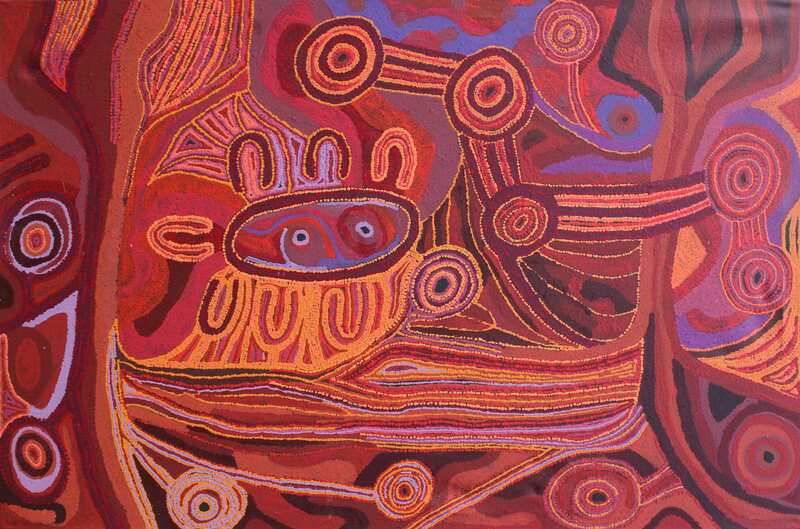 This Tjukurpa is about the constellations of Pleiades and Orion. The sisters are constellation of Pleiades and the other star Orion is said to be Nyiru or Nyirunya (descrived as a bad, untrustworthy man). For Teresa, the story is "about family looking after each other, and teaching and helping each other. The women being followed by a bad man, but the older sisters are looking after the younger ones. I have four daughters, and sometimes we work together on large paintings telling the Kunkarunkara Tjukurpa. That's our way- working together and looking after one another."